Recent efforts in reconstructing historical sea level change have led to a range of published estimates for the global mean sea level trend over the last century. Disagreement in these estimates can be attributed to two factors: (1) differences in analysis and/or reconstruction techniques and (2) differences in tide gauge selection and quality control of the data. Here the impact of tide gauge selection is explored by calculating global mean trends using three different tide gauge data sets that have been utilized in recent reconstruction studies. 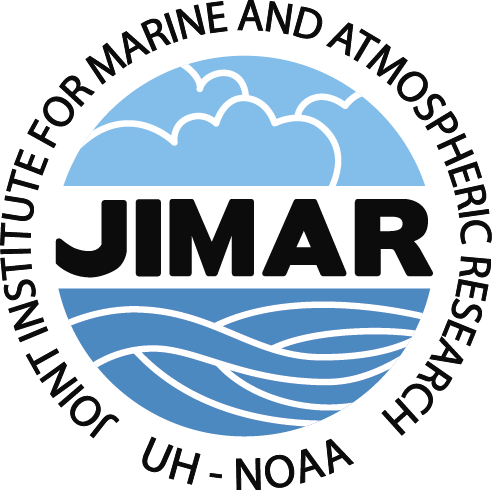 The inclusion of tide gauge records that are affected by unresolved internal variability and/or unaccounted for vertical land motion are found to significantly impact the estimates of the long-term trend in global mean sea level. In conclusion, several guidelines are presented regarding the selection of tide gauges for use in historical reconstructions focused on estimating the 20th century global mean sea level trend. Figure. 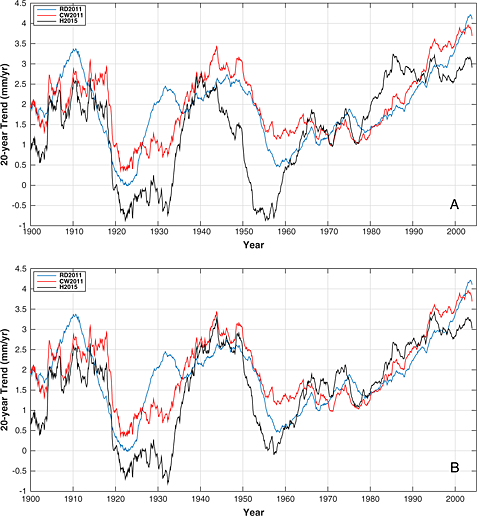 Twenty-year trends in global mean sea level (mm/yr) from 1900 to 2013 estimated by simple averaging of tide gauge data sets from Ray and Douglas (2011) (blue), Church and White (2011) (red), and Hay et al. (2015) (black). (a) The trends using all of the available gauges. (b) The trends after removing the tide gauges at latitudes higher than 65°. This results in curves for RD2011 and CW2011 that are the same in both Figures 3a and 3b. Simply averaging the tide gauge data qualitatively reproduces differences between the sophisticated reconstructions performed in each study (e.g., substantially lower rates of change earlier in the century from Hay et al.). This suggests that a substantial fraction of the differences between the reconstructions may be due to the particular set of gauges used in each case. Hamlington, B. D., and P. R. Thompson (2015), Considerations for estimating the 20th century trend in global mean sea level. Geophys. Res. Lett., 42, 4102–4109. doi: 10.1002/2015GL064177.